Recently I went into Crystal Pepsi’s story, with a footnote about Tab Clear. 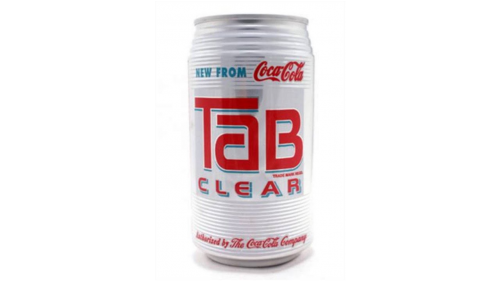 As the story goes, in order to stave off any loss of market share to the new clear Pepsi product, Coca-Cola introduced an intentionally doomed product – Tab Clear – to turn the public off of the idea of clear sodas altogether. The argument supporting this is that Tab Clear was positioned as a diet drink, making the inference that Crystal Pepsi was, too, which further muddied public perception of the already confusing Pepsi product. I’m not sure how much of this is true and how much of it is Monday morning quarterbacking, but the truth remains that right around the time Tab Clear hit the market both products crashed and burned, paving the way for Clearly Canadian to have a real moment in the early-to-mid ’90s. I choose to believe the story of Tab Clear’s suicide mission. When you look at this 1993 ad it’s clear that there’s no real philosophy behind the marketing and that it’s just another random, “edgy”, quick-cut-absurdity ad from the ’90s. It could be an ad for a SEGA product, a zit cream, or a Snickers and it’d be roughly the same copy. I’m not saying this is proof of kamikaze intent, I’m just saying there’s no real effort to succeed here. This ad that aired in Japan doesn’t strengthen or weaken my case; it’s just fun to include. What’s even happening here?